My Dog Has Bad Breath - Help! Phew! My Dog Has Bad Breath! If your dog has bad breath you'll certainly know about it! Find out what causes canine bad breath and what you can do to make your loving Cocker Spaniel's kisses fresh and sweet once again. My Dog Has Bad Breath: What's Causing It? 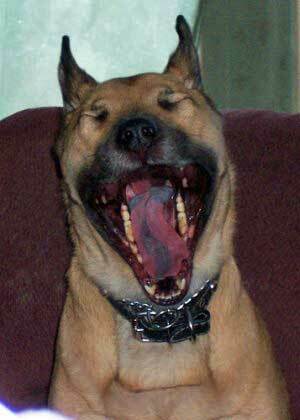 Despite the unfortunate term 'dog breath', canines aren't meant to have bad breath. But if your Cocker's breath does smell less than fragrant, the cause of his stinky breath will usually be mouth-related. I say 'usually' because your dog's bad breath could also indicate an underlying illness. So check out his dental and oral health first. If his mouth and gums seem healthy, his bad breath may be a symptom of something more serious, in which case, take your dog to see his vet and get a professional diagnosis. Bits of food trapped between your dog's teeth can attract bacteria. When food and bacteria combine, plaque begins to form. If plaque isn't removed, a hard residue called tartar is formed. Tartar will attract more bacteria to the surface of the tooth and to the gum line, which then creates more plaque and more tartar. Plaque and tartar can lead to gingivitis and periodontal disease and that's when your Cocker's breath begins to smell dreadful. So if your dog has bad breath, take note! As the bacteria multiplies, your Cocker's gums may become inflamed and infected. They may also bleed. This is known as gingivitis. Pyorrhoea is a more serious inflammation of the dog's gums and if left untreated (or undiscovered) pus will develop and the condition will worsen, leading to loosening of the teeth. If the tartar isn't removed it builds up underneath the gums causing damage to the tissue that surrounds and supports your dog's teeth. It's at this point that the damage is referred to as 'periodontal disease', which can be very painful for your pet and can lead to abscesses, loosening of teeth, tooth decay, and tooth loss. Advanced periodontal disease is irreversible. In severe cases, the bacteria enters the bloodstream and can lead to damage of vital organs such as the heart, the liver and the kidneys. If you'd like to understand just how serious periodontal disease can be, and what it looks like, the American Veterinary Dental College can help. The good news is that gingivitis, pyorrhoea and periodontal disease in general are easily prevented. Brushing removes plaque and kills bacteria. With regular brushing (as well as making sure the vet gives them a thorough check each time you visit his surgery) you can be certain your Cocker's teeth and gums will remain healthy. Unfortunately you can't remove tartar just by brushing so it's best not to let it form in the first place. Removal of tartar will need to be done by your vet, by a de-scaling process under anaesthesia. However, once done you'll then be able to keep plaque and tartar at bay by brushing your dog's teeth every day. 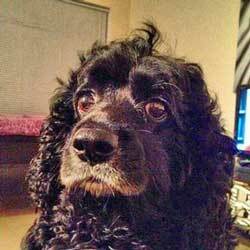 Your Cocker Spaniel's diet could also have an impact on his breath, especially if his diet is unbalanced. I recommend feeding your dog kibble, rather than wet food. Not only can you guarantee that his diet is fully nutritious, but the abrasive biscuits can also help to keep his teeth clean. If your dog has bad breath, you can even buy 'pet breath mints' which can sometimes help with the problem. I haven't tried them myself, so I can't really say one way or another, but I guess anything's worth a try to get his breath smelling sweet again! If you can safely rule out oral hygiene problems, and your dog's bad breath continues for any longer than a couple of days, then a trip to your vet is highly advisable. You want to be certain he's okay, don't you? Bad breath is generally either the result of poor oral hygiene or an underlying health problem. If your dog has bad breath and you don't brush his teeth regularly, it's time to introduce a new oral hygiene routine for your pooch! An ideal time to begin is when he's very young, but you'll probably need to help your puppy get used to having his teeth brushed first, otherwise it will be difficult for you both. If your Spaniel is an older dog, please don't let that stop you - begin today. It may take a little longer to accustom him to having his mouth and teeth inspected and brushed, but it will be the first step to making sure his mouth stays clean and healthy. Regular trips to the vet for oral inspections and de-scaling when advised will also help to keep your dog's teeth healthy. Where your dog's poor breath is caused by a virus or an infection, your vet may decide to treat the problem using antibiotics, an anti-inflammatory or an anti-fungal, depending on the cause. My dog has bad breath!